You meander through the trees, hoping to find another creature. Perhaps you'll even manage to find something talkative, who can tell you a bit more about this place and what other wonders there are in the land. You keep your eyes open for any movement, and your ears listening for any crack of a stick or crunch of a leaf. A fierce whinny, followed by a snort and the crash of undergrowth sets you in motion. You rush towards it, wondering if there's some battle in progress between an equine and some predator, or something like that. When you stumble across the source of the sounds, you find that you are wrong. Only one creature stands before you. 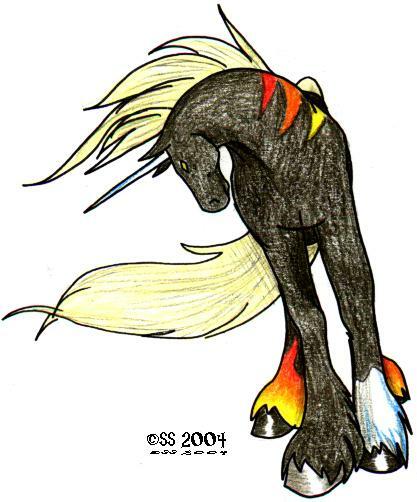 He breathes heavily, and has a wild fire in his eyes as he glares out from under his forelock. You involuntarily take a step back. "What is it that you are seeking, human?" You start a bit at his question and take another step backwards before stammering out an answer. "Well, there is only one creature to see here," he replies, still breathing heavily, as if he'd just run for a length of time. "I am the Lord of this part of the forest. Have you any better reason for being here, or are you simply going to stand around and stare at me all day? My patience runs low, and the path is that way." He gestures with a curt shake of his head towards the left, and you mumble an apology and make quickly take your leave. He reminds you of someone, or someones, though you can't immediately place who. Then your mind returns to the Crystal mare that had passed you while you walked along the bank of the stream; perhaps she was his mother? And a memory of an equally dispassionate stallion comes to mind as well... with a sigh, you let the thoughts slip past and concentrate on walking onwards through the forest.